The Discovery Coast Atlantic Forest Reserves is a region of tropical and subtropical moist forest, tropical dry forest, tropical savannas, and mangrove forests. They extend along the Atlantic coast of Brazil from Rio Grande do Norte state in the north to Rio Grande do Sul state in the south, and inland as far as Paraguay and the Misiones Province of Argentina. 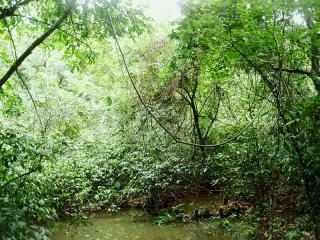 The Atlantic Forest is unusual in that it extends as a true tropical rainforest to latitudes as high as 24'S. This is because the trade winds produce precipitation throughout the southern winter. In fact, the northern Zona da Mata of northeastern Brazil receives much more rainfall between May and August than during the southern summer. It was surprising to me to see this WHS hasn't been yet reviewed. Discovery Coast is by no means a difficult place to reach or uninteresting area to be looked down, all the way around. It is made up of several Atlantic Rainforest reserves, most of them close to Porto Seguro, a vibrant city (and with a famous carnival) that is also situated in the area where the first Portuguese colonizers arrived in Brazil (year 1500). I have visited this reserves many times when I was a kid and also recently with my father. I could not see (and I doubt there is, at least for the casual tourist) any significant distinction between Discovery Coast Atlantic Forest (in States of Bahia and Espírito Santo) and the Atlantic Forest South-East situated more southerly (in São Paulo and Paraná States). In any case, the exuberance of the tropical rainforest (along with good trekkings, waterfalls, birdwatching, etc.) usually pays off the visit. Do not expect, however, the same facilites and tourist infrastructure that can be found in Iguaçu or other more famous sites in Brazil. Late Pleistocene: As planícies fluvio-marinhas (complexos praiais, estuarinos e aluviais) são constituídas por sedimentos quaternários, depositados no intervalo de tempo entre o Pleistoceno Superior e o Holoceno.